An unusual collectors item - a native Australian bamboo from Arnhem Land in the Northern Territory. The new shoots are edible and have a very distinct bright light green colour, turning orange yellow as they harden. 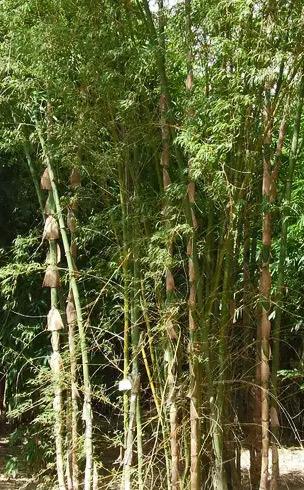 Upper stems and branches arch gracefully and the clumping bamboo is useful as a screen in larger properties. The culms are strong and almost solid and are great for building. It is thought the original didgeridoos were made from bamboo. See http://www.guaduabamboo.com/working-with-bamboo/bamboo-didgeridoo for instructions. Grows in tropical to subtropical climates, with temperatures down to 0?C. Happy in full sun to part shade, in moist, well drained soil. Keep well mulched.